Black Duck farm is situated just out of Leongatha on the way to Mirboo North amongst beautiful green countryside and rolling hills. Set in a private location on the property, the self contained B&B Cottages take advantage of the wonderful views and serene environment. The B&B Cottages are beautifully appointed and tastefully furnished. Sleeping accommodation supports 2 adults in either a king sized bed (can split to 2 king singles) or a Queen sized bed, additional sleeping for 1-2 adults via a fold-out deluxe double bed settee. The large bathrooms are bright and open and offers a spa bath and overhead shower or double shower. The open plan lounge/kitchen area is compact but very comfortable and opens to the outdoors via double sliding doors. Features include split system heating/cooling, flat screen TV/DVD, microwave, Nespresso coffee machine. You will have access to an outdoor courtyard offering a fully equipped BBQ and amazing views and tranquillity. Perfect place to relax and enjoy a wine or two, stay cosey inside or enjoy the outdoors on long summer evenings. Set on more than 20 acres this private property hobby farm offers spectacular views and supports a range of colourful wildlife and bird watching including Rosella's, Kookaburra's, King Parrot's, Eagles and many pretty smaller varieties. A small number of sheep provide a close look at baby lambs when in season. The private gardens on the property are available for a wander where you will find a French and Japanese Garden, Olive Grove, Orchard and Vineyard. Situated only 10 minutes from the Leongatha, a town of approx. 5000 that offers excellent facilities, and within 30-45 minutes interesting smaller towns including; Fish Creek, Mirboo North, Meeniyan, Koonwarra and Foster. A number of seaside locations are in easy traveling distance including; Inverloch, Venus Bay and Wilson’s Promontory. Great walking and riding trails for the energetic, along with many stunning golf courses to enjoy. All this will ensure that you have the best of both worlds and your stay will never be short of things to do or places to visit. Black Duck farm is situated within an avenue of Oak trees dedicated to World War One. The avenue of trees starts at the commencement of the property line and runs on either side of the road to the main drive. There is a plaque located on the corner of Leongatha Yarragon Road and Wooreen Mirboo North Road opposite the property entry and a parking and picnic area on the same side of the road to the south. Also opposite the property is the is the old Wooreen State School that was the site of the Farraday kidnappings 1977. Tom and Deb are hobby farmers enjoying the country lifestyle. Having moved to the property in 2012 they now have a vineyard, orchard and olive grove, lovely gardens and very happy sheep grazing the luscious green paddocks. They are keen to share the serene environment with guests by offering accommodation in two lovely B&B Cottages. A lovely serene country escape perfect for a quiet restful or romantic getaway. Cosy rooms that a beautifully appointed and have everything you need to have a relaxing holiday. Pretty gardens to wander around and enjoy or just relax in a private courtyard taking in the fresh air, local wildlife and rolling greens hills. Beautiful views of the surrounding hills and countryside. Plenty of things to keep you entertained around the local area including galleries, wineries, cafes and restaurants, markets and beautiful views. Cottages are within a 20 acres hobby farm property in rural Gippsland. 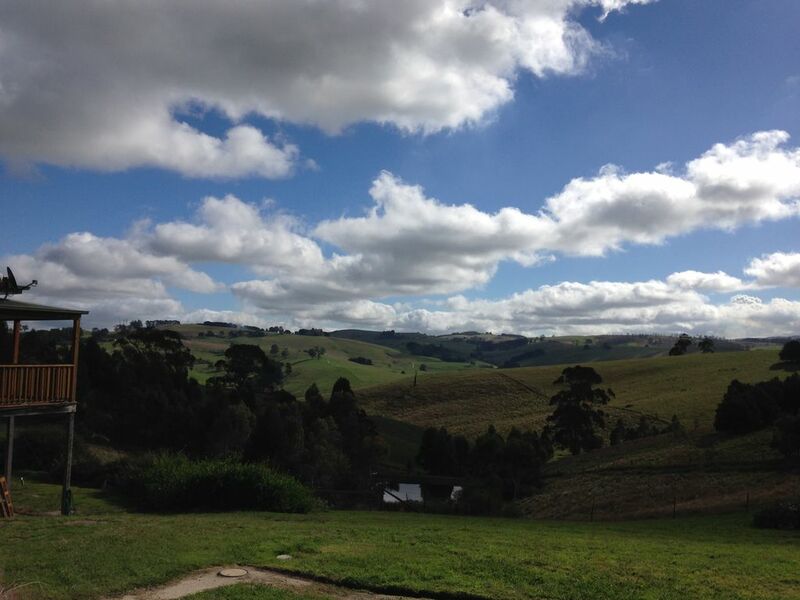 Views from the cottages are across the lush green Gipplands hills. Thanks Esther. Glad you enjoyed it and we hope you come back again. Perhaps the sun will shine next visit. We had a lovely weekend at the Aegean Black Duck Cottage. All amenities great including spa bath, and we were treated to bubbly and Easter eggs! We had a wonderful stay, owner was very friendly. Cottage was very clean and has everything we needed. Thank you! The property at Wooreen is close to many attractions including; walks, cycle paths, galleries, cafes & restaurants, market and wineries.